The new British Rail services known as Thameslink were opened by Princess Anne on this day 30 years ago. Full services began between Bedford and Brighton on 16 May 1988. Some services also went to Guildford (these were later cut back to Sutton.) The line’s expansion and its first automatic trains began just recently. In the three weeks before full public services actually began, there were a number of trial runs each day. Some of these were public services, though British Rail warned these were not guaranteed and could be withdrawn at any moment. I travelled on the services between King’s Cross and London Bridge during these sampler runs in 1988. Thameslink trains in the older livery at Farringdon when Moorgate services still ran – 31 January 2002. 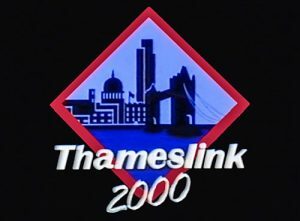 Thameslink’s official opening was on 25 April 1988. Just after 10.30am the Princess Royal arrived at King’s Cross Midland station. After a brief introduction to dignitaries Princess Anne joined the driver’s cabin of this special Royal train consisting of class 319 stock. Present day view of the Snow Hill tunnel as seen from the end of Farringdon’s platforms. At Blackfriars a special ceremony awaiting the Royal party. Over 500 children cheered the arrival of the train waving flags and banners to welcome the Royal party. Once on the platform the Princess unveiled the train’s name – specially created just for this day. It was ‘The Save The Children Week Special.’ Her Royal Highness was then the charity’s President – she is now its Patron. Leaflet launching the new Thameslink May 1988. After the ceremony, these 500+ children joined the Princess on the special which left Blackfriars for Crystal Palace where it arrived at at 11.50am. A special launch party organised by Network South East was held here in aid of Save the Children. The charity and the 500 plus young guests helped to celebrate the official opening of the brand new Thameslink services. Chris Green’s claim of ‘frequent’ services was somewhat arguable. Due to the bottlenecks at Metropolitan Junction and London Bridge station, no more than a maximum of six trains an hour were possible on the line’s flagship Brighton route. It meant Thameslink despite aspirations wasn’t exactly a turn up and go Metro service. This became one of the reasons for the recent major upgrade originally proposed as Thameslink 2000. 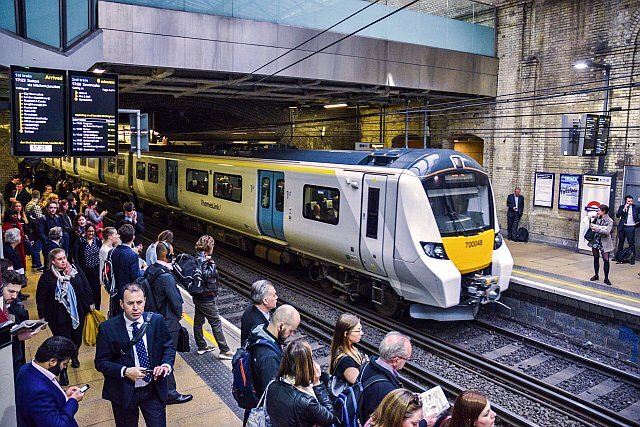 A new London Bridge station, extra tracks and the doubling of Metropolitan Junction have helped to remove practically all the bottlenecks and Thameslink can now provide a truer Metro service. 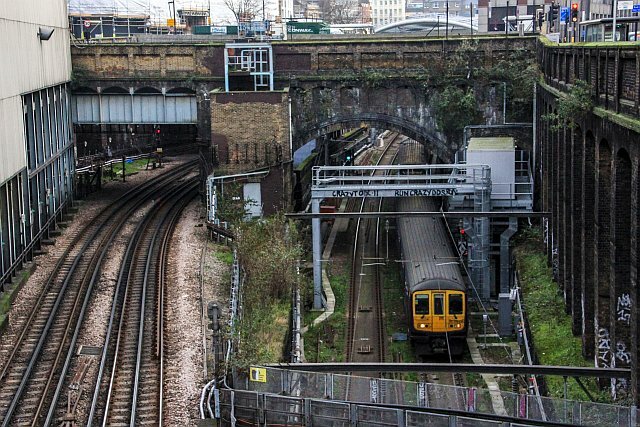 It cost £7 million to restore the through lines between Farringdon and Blackfriars. This was quite cheap compared to the slightly later works which would be needed to remove almost all of the newly opened lines and rebuild them on a different alignment. This was neccessary to remove the Ludgate Hill bridge and build a new underground station at St. Paul’s (now City Thameslink.) 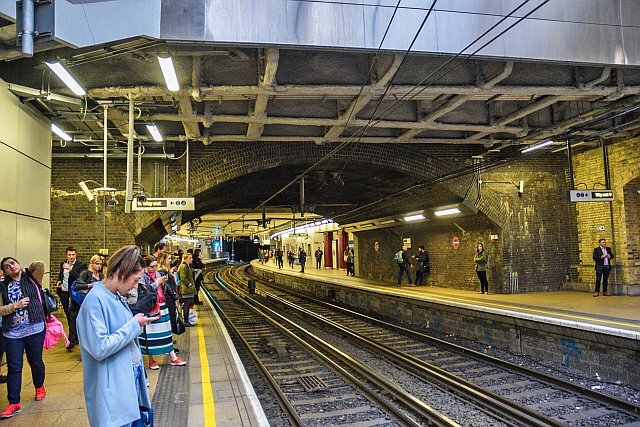 This was followed by the even more expensive works to rebuild Farringdon station and new stations at other locations including St Pancras Thameslink, Blackfriars, and other elements of the ‘2000’ project. 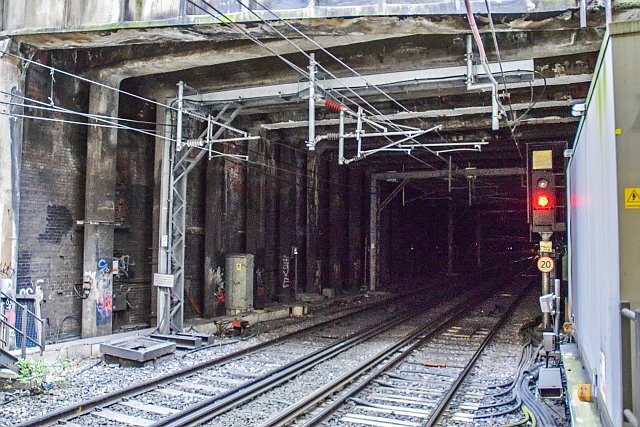 A major part of the work saw the new Canal Tunnels section constructed to provide a direct rail connection to the Great Northern Lines. At the opening day party thirty years ago Chris Green promised a new station at St Paul’s would be opened in October 1988. This entailed a construction period of just six months to build what we now know as City Thameslink. It seems Chris Green was rather over confident the new station would be opened in that short time scale! 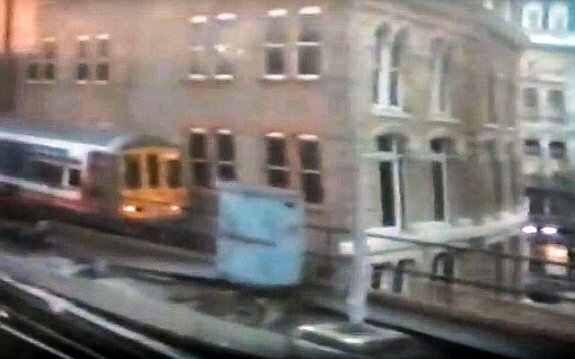 View of a 319 heading north past the old Metropolitan Railway’s Vine Street (Clerkenwell) goods depot. He couldn’t have been more wrong. Thameslink, despite numerous teething problems in its early days, proved to be more successful than expected. Many passengers indeed travelled from Bedford to Brighton or vice versa as well as using the line for numerous new cross-London journeys. In order to understand how Thameslink began, we need to go back a bit. The line’s origins began quite early in earnest. The original component, the £85 million pound Bed-Pan electrification (as the scheme was popularly called, being short for Bedford-St. Pancras) had its contracts let out in 1978. The Bed-Pan project included the branch down to Moorgate. The first Class 317s began on test to Moorgate from 26 April 1983 whilst public services began on 11 July the same year (including the re-opening of the refurbished King’s Cross Midland station.) 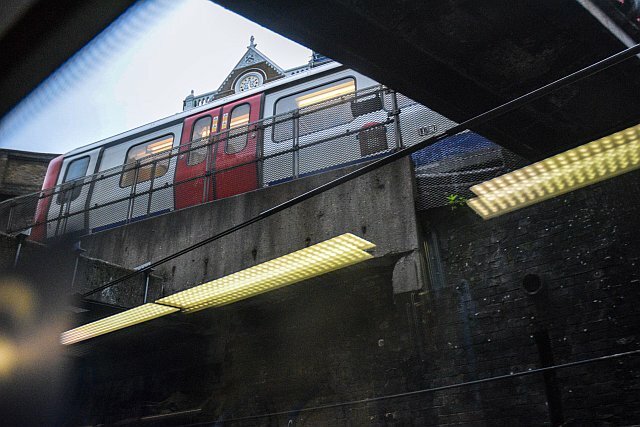 In the early stages of planning it was realised the new Bed-Pan line could be connected to the Southern’s third rail system via a re-used Snow Hill tunnel. A feasibility study was set up in 1978 to explore the options of creating a new north-south railway link through London. This project became the new Network South East’s brainchild (they too devised Thameslink 2000 – recently completed in somewhat different form.) Network South East’s engineers set about preparing the closed railway route through Snow Hill for the re-laying of tracks. It wasn’t a straightforward job because no-one had envisaged the tunnels being used for trains again. They were instead used for car parking and major storage facilities. The businesses concerned had to be removed before the tunnels could be refurbished and the trackbed restored. The tracks and signalling through the Snow Hill Tunnels were laid at the end of 1986, almost a year and half before the first public trains began running. 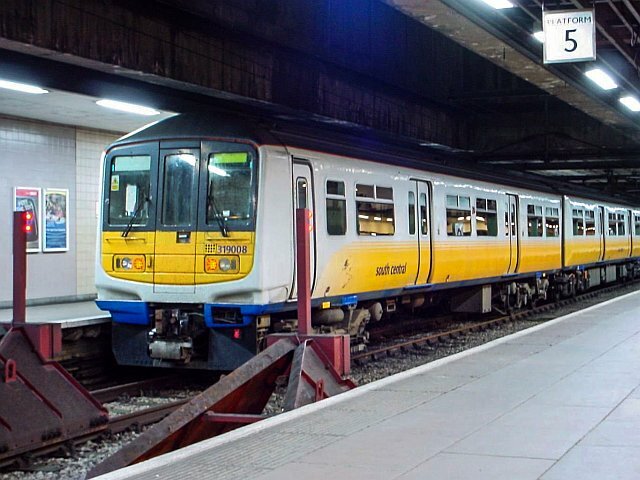 The construction of the initial batch of sixty Class 319 trains for Thameslink began in 1987. 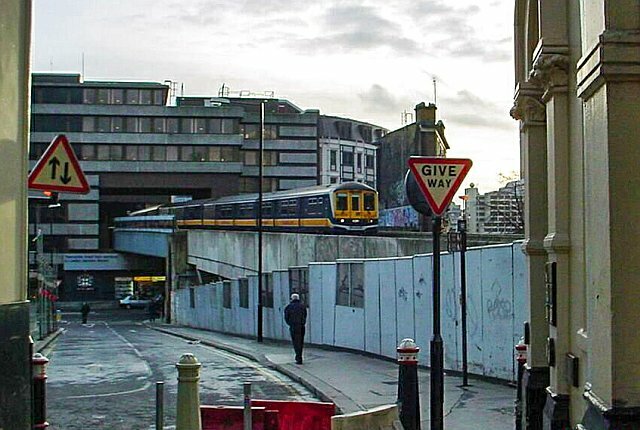 View of a 319 on the City Thameslink ramp – Xmas Eve 2001 – long before the new Blackfriars station was built. One small downside of the new Thameslink services was the reduction in the number of trains along the Widened Lines to Moorgate. These were reduced to peak hours only. This wasn’t seen as injurious as passengers could instead continue by tube from Farringdon. Thameslink and the full services to Moorgate ran together for a whole three weeks until May 16th 1988, the day Thameslink began its full services, Moorgate’s were truncated. Almost exactly twenty one years later the last train rolled out of Moorgate 20th March 2009. Few realise it is the Moorgate services that ultimately enabled Thameslink to come into being. I’m not referring to the Bed-Pan but rather something much earlier. Its is a subject I shall return to in a few weeks time when the next Thameslink anniversary – one of several throughout 2017/2018 – arises. The previous anniversary I wrote about here. Class 319 at Farringdon on one of the special workings. 12 May 1988, a few days before services officially began. Farringdon on 24 April 2018. The same exact location as the previous picture I took 30 years ago! Another pre-launch Thameslink service, seen entering the renewed Snow Hill tunnel. 12 May 1988. Class 73 at Farringdon during major track relaying work. Eight of these ventured onto Thameslink with engineers trains! 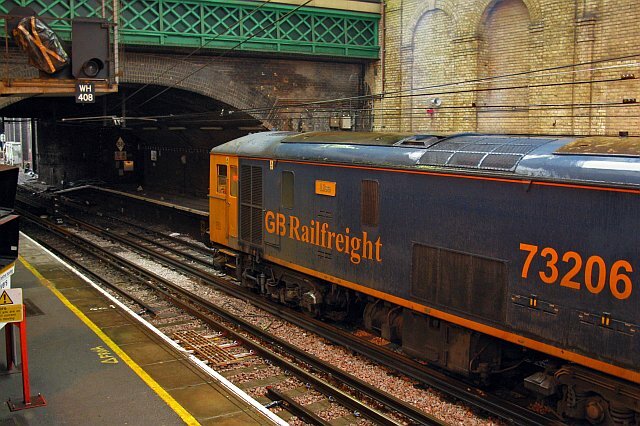 Over a number of weekends (including 28/29 December when the above picture was taken) in 2009 a fleet of Class 73’s were used to help with major tracklaying works on Thameslink. Part of this task involved the removal of the junction to Moorgate. The picture above shows the theatre indicator for that line wrapped out of use ready to be removed. Rail News said the use of Class 73’s on Thameslink was totally unprecedented and a feat not repeated since. The full list of 73’s observed were: 73109, 73141, 73201, 73204, 73206, 73207, 73212 and 73213. My picture of a Connex South-Eastern train on Thameslink duties at Moorgate. 2nd May 2003. 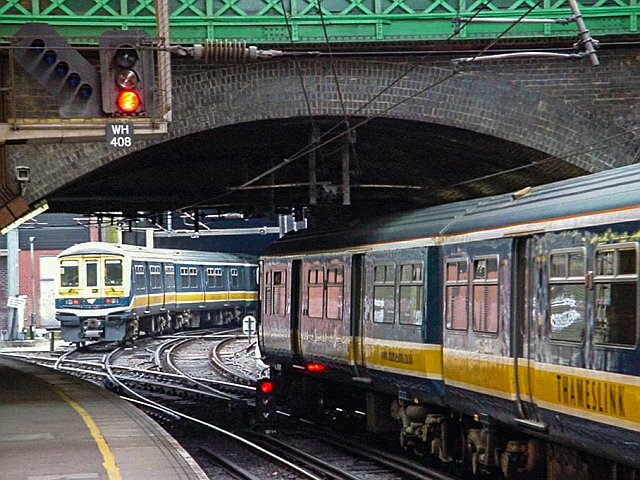 The explanation for Class 317’s (and a pair of Connex South Eastern units) making their way onto Thameslink. Rail November 1999. Although the 317’s were used for a short while, other 319s were drafted in. Thameslink countdown board at Barbican – photographed in 2018! Several core Thameslink stations had this multi-coloured countdown board put up in 2009 to herald the start of the thameslinkprogramme (the former ‘2000’ project.) This board still exists at Barbican – that’s NINE years after the last Thameslink trains passed through this station! The rainbow coloured displays have long since vanished from other stations associated with Thameslink. Normally TfL’s Barbican staff keep the Thameslink board hidden behind the other one which can also be seen in the picture. These pictures show the adverts are from November/December 2009 extolling the fact the old King’s Cross station would be replaced by the new one at St Pancras on 9 December 2007. This must be one of the few locations where First Capital Connect adverts can still be seen. To some of the line’s long suffering commuters, FCC was known as First Crapital Connect (link) and thus explains the rather critical website in question! Anyhow things have moved on and Thameslink’s looking far more rosy these days. The old King’s Cross station is not exactly disused although there is no longer access to the Thameslink platforms. One can still buy tickets here (or use Oyster etc) during weekdays only and use the escalators and tunnels leading down to the Piccadilly and Victoria Line platforms. The facility is clearly important enough to warrant keeping this station partially open. Previous Post: Sherlock Gnomes takes over Baker Street station!